– CATHEDRAL MOUNTAIN GUIDES is a New Hampshire climbing guiding service founded in 2008 by American Mountain Guide Association certified guide Bayard Russell, Jr. and now run in partnership with local guide, accomplished alpinist and Piolet d’Or Recipient, Freddie Wilkinson. Cathedral Mountain Guides seeks to provide safe, high-quality private technical climbing experiences in the White Mountains and Northeast region. The safety and wellbeing of both clients and guides is our first priority, every day we operate. Bayard has been guiding in New Hampshire since 2003 and founded Cathedral Mountain Guides in 2008. He is a certified Rock Instructor through the American Mountain Guides Association and very involved with the local Mountain Rescue Service, New Hampshire’s volunteer technical rescue group founded in 1972, with which he serves as a Director and Team Leader. Freddie loves to climb. He has made significant alpine first ascents around the world, including new routes in Alaska, Patagonia, Nepal, India, and Antarctica. 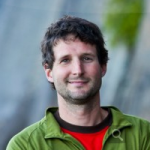 He has received both the Robert Hicks Bates Award from the American Alpine Club (2007) and the Piolet d’Or from the Groupe de Haute Montagne (2012) for his achievements in the mountains. Freddie’s various jobs include writing books, blogs, and articles related to climbing, taking pictures and making movies of people climbing, giving slideshows and talks about climbing adventures he’s done, and — his favorite — working as a climbing instructor and guide in the White Mountains of New Hampshire and western Maine. Whether it’s hiking up the Lion’s Head in stiff winter conditions, scampering up one of the classic moderate multi-pitch rock climbs of Cathedral Ledge, or getting gnarly on advanced mixed terrain, Wilkinson finds perpetual inspiration safely sheparding clients through new climbing experiences. Freddie believes that any adventure is only as good as the stories you bring home.